[CONT](VC):During your turn, if your drop zone has ten or more cards, this unit gets [Power]+5000/[Critical]+1. 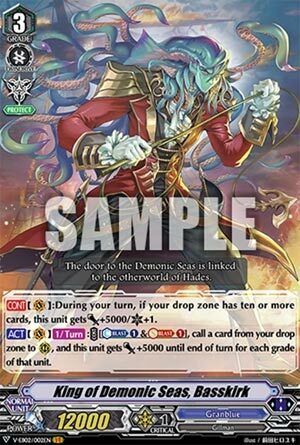 [ACT](VC)[1/Turn]:COST [Counter Blast (1) & Soul Blast (1)], call a card from your drop zone to (RC), and this unit gets [Power]+5000 until end of turn for each grade of that unit. S’pretty okay, I guess. I’m not going to make any claims on how easy 10 cards in the drop is as soon as you ride this, but it doesn’t sound that easy unless you minus yourself a lot or open with a ton of milling skills in your hand. Some may find that annoying as Overlord and Daiyusha can set themselves up rather easily and are live pretty much as soon as they appear, but at least as soon as it IS live you need do nothing else. The second skill is basically a consequence-free way to commit to a board and save hand, which is in line for a Protect clan. Also combines well with its passive Crit so it carries pressure…assuming the opponent doesn’t just PG it. Loses points for the risk of the passive crit being set up too late to matter but at least it can raise a decent field together.